Pictured are friends, family and gym mates in the funeral procession for innocent shooting victim Bobby Messett. A FUNERAL GATHERING has heard of the “huge void” left in the lives of the family of Bobby Messett, an innocent victim killed in a shooting at Bray Boxing Club on Tuesday. Bobby died from the wounds sustained after a gunman burst into the popular boxing club and shot him and two other men, before escaping in white van. The fifty-year-old grandfather was shot dead when he answered a knock at the door of the gym shortly before 7am on Tuesday morning. The father of three from Kilmacanogue in north Wicklow was very highly thought of and was known in his community for his love of exercise. He is believed to be a completely innocent victim who was in the wrong place at the wrong time. Bobby’s family was joined by hundreds of mourners today as they laid him to rest following a service at in St Mochonog’s Church, Kilmacanogue. 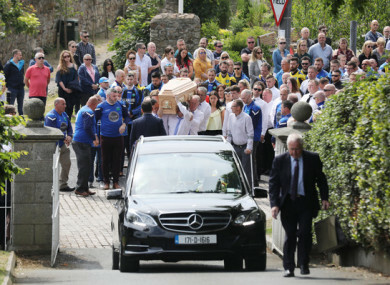 Teammates of Bobby’s from the local Glencormac United Football Club as well as members of the Bray Wheelers Cycling Club formed a guard of honour as his coffin was brought into the church. Chief celebrant Fr Dan Nguyen spoke of Bobby’s love of sport and love of his family, as well as the shock and pain felt at his sudden killing. “He has died too tragically and suddenly. Too soon,” Nguyen said. “But this tragedy has allowed us to see the remarkable impact which Bobby has made on those in his life. Bobby’s son Gary spoke about how a “huge void” had been left in the lives of his family and friends. “Sport played a huge part in his life. It’s where he made most of his closest friends. Starting with Glencormac United right through to cycling and all the ones in between, which are loads,” he said. Da never sat still for a minute. He looked to keep busy and he did just that. He’s left a huge void in our lives that will never be filled again. After the mass, Bobby was buried in a cemetery adjoining the church. Gardaí are still searching for those responsible for the shooting which claimed Bobby’s life and left two others injured. Shortly after the shooting, the gunman, who had his face covered drove the van from Bray through Shankill and the Cornelscourt area before being abandoned on Pigeon House Road at approximately 8.05am Tuesday morning. A man was seen leaving the van and cycling away. Email “'He touched many lives': Funeral hears of 'huge void' left by man killed in Bray shooting”. Feedback on “'He touched many lives': Funeral hears of 'huge void' left by man killed in Bray shooting”.